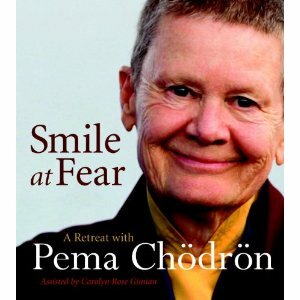 Today was not the usual full day in my studio as I was organizing and packing for my trip to Texas tomorrow. I was able to string the necklace for my turquoise cabochon. Originally, I wanted to have each strand directly attached to the beadwork framing the cabochon but the beads didn’t lay right when I tried it. Then I tried adding a bead in between a couple of the caramel picot beads on top. As I did that, I realized that I could peyote stitch a piece coming out of the top. Furthermore, that piece could be built up 3 rows, one for each of my necklace strands. The small oval turquoise beads were purchased at the Whole Bead show a couple of weekends ago. I brought the cab with me to the show so I could match the color of the turquoise. It’s amazing how many different colors turquoise beads can be! I’m still mulling over what to do with the clasp. I also got a little time in on my September journal bracelet. The turquoise beads on either side of the tree spirit face were also purchased at the Whole Bead show. I love the crackle pattern in them. I looked on the Weather.com website and saw that it will be 87 degrees down in Texas. It’s a good thing I hadn’t put my summer clothes away just yet. Be back on Sunday! 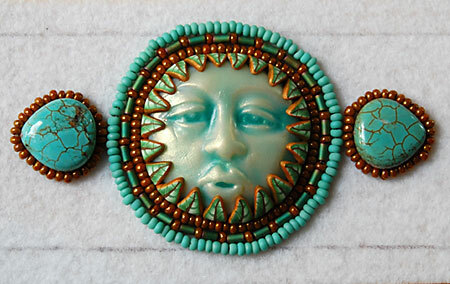 This entry was posted in Beaded Journal Project, Beads, Color, Creativity, Jewelry, Journaling, My Studio, Photography, Polymer Clay, Stones, Travel and tagged Beaded Journal Project, journal bracelet, polymer clay face cabochon, turquoise, turquoise cabochon, turquoise necklace. That is a fantastic necklace! I love turquoise. It’s such a rich and glowing gift from the earth. Enjoy your trip! Hope you have a wonderful time visiting in the south. Love what you are doing with those southwest inspired colors! Thanks so much Nina! After being in Texas weather for 3 days, I much prefer our changing cooler New England weather. I know that your weather in NC is similar to ours (a tad gentler, I think) with a change of seasons. It was a shocker coming out of the San Antonio airport dressed in fall clothes! Thanks Steph! 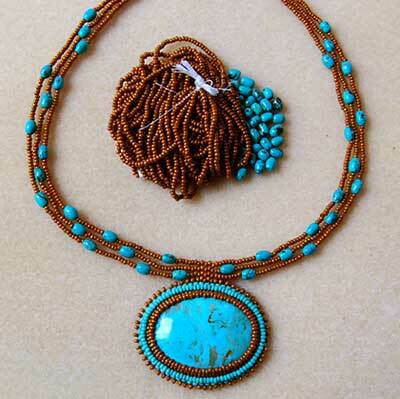 The necklace was a joy to create with those rich turquoise colors. Trip was great. Welcome back from Texas, Karen ! I love how your necklace turned out. Your solution for attaching the cabachon was very creative, and it gives the necklace a beautiful drape.